Home Blog Running Technique: Is changing from a heel first to a mid-foot running style beneficial? Over recent years there has been increasing interest in the potential benefits of changing from a heel first running style to mid-foot strike. Advocates of mid-foot running styles claim decreased injury rates and improve running efficiency, compared with a heel first running style. Since the majority of runners naturally use a rear-foot, or heel first running style, this has led to athletes and coaches looking to ways to change their natural running style in the belief that this may improve running efficiency, exercise performance and reduce injury rates. In order to achieve this specific drills are often utilized to try to encourage a change towards a midfoot or forefoot strike. Should you change your natural running style? In a recent study published in the Journal of Applied Physiology (Gruber et al., 2013) researchers looked at the effect of changing footstrike patterns on running economy and carbohydrate oxidation in a group of natural rearfoot runners (19 runners) and forefoot runners (18 runners) across three different speeds (slow, medium and fast). To do this the researchers recorded oxygen consumption to analyse running efficiency, and carbohydrate oxidation to assess the reliance of carbohydrate metabolism, during the runners natural footstrike pattern and also when they ran in the alternative footstrike pattern. When the runners were using their natural footstrike pattern there was no significant difference in either running economy or the percentage of carbohydrate oxidation between the two groups. However when the natural rear foot strike runners ran with a forefoot running style their running economy decreased and they had a greater reliance on carbohydrate metabolism (indicating reduced reliance on fat metabolism) at slow and medium speeds. Even at faster running speeds the forefoot running pattern was found to result in a greater oxygen cost but didn’t significantly change carbohydrate utilization. The researchers concluded that the forefoot pattern was not more economical/efficient than rearfoot running. This is in agreement with previous research that has also failed to observe differences in running economy between a forefoot and rearfoot strike (Perl et al., 2012). Similar results have been observed when comparing heel first running with a mid foot running style. In a recent study, researchers analysed midfoot and rear foot running styles for ground contact time and running economy (Michele and Merni 2013). The researchers observed that midfoot strikers had a significantly shorter ground contact time than rearfoot stikers. Whilst a shorter ground contact time might sound good there was no significant difference in running economy between the midfoot and rearfoot strikers. Interestingly a shorter ground contact time actually resulted in an increased oxygen cost, or reduced running economy, compared with a longer contact time. This is in contrast with previous research that suggested that a shorter ground contact time might contribute to improved running economy (Hasegawa et al., 2007). One of the big claims made about the benefits of mid-foot and forefoot running is a reduced injury risk. It’s known that rearfoot runners experience higher rates of repetitive stress injury and research suggests that they may experience twice the rate of stress injuries compared with those that use a “natural” forefoot strike (Daoud et al., 2012). Research suggests that forefoot runners experience less stress around knee. However, there is a trade off against this in that there is greater stress placed through the Achilles tendon which may increase the risk of foot and ankle injuries (Kulmala et al., 2013). In fact research suggests that non rear foot strike patterns result in a significant increase (>10%) in Achilles tendon impulse which equated to >45 additional bodyweights through the Achilles tendon for every mile run in a non-rearfoot strike pattern (Almonroeder et al., 2013). The researchers suggest that runners looking to change from a rearfoot strike need to adapt their training plans to account for the extra stress placed through the Achilles tendon. Although there appears to be greater stress associated with rearfoot heel striking it is not clear whether changing a natural running style is beneficial in fact research suggests that retraining a natural running style may not provide benefit. Recent research comparing the benefits of specific midfoot strike retraining found it to be less beneficial than using low-heel height footwear (Giandolini et al., 2013). The researchers found that while the use of low-heel trainers led to significant reductions in heel acceleration and shock propagation (a measure of shock) there was no significant change in the midfoot strike retraining group. Despite the claimed benefits of changing from a heel first to a mid-foot running style, researchers have failed to observe improved performance when natural heel first runners change their running style to a mid or forefoot running style. Therefore changing running styles is unlikely to lead to significant improvements in running performance. Whilst there appears to be a reduced risk of knee and hip injuries with “natural” non-rearfoot running styles it is not clear whether this reduced risk transfers to natural rearfoot strikers who deliberately change their running style through retraining. In fact research suggest that changing from a heel first to a mid-foot running style may not be of beneficial for injury reduction, even when it is done in a controlled manner. 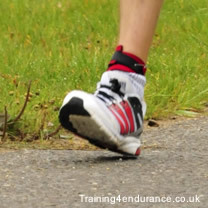 It is also important to remember that non-rearfoot strike running styles place a significantly greater stress on the Achilles tendon and if your Achilles tendon is not used to this additional strain – as would be the case with natural rear foot strikers switching to a mid foot strike – then you will be at an increased risk of Achilles or ankle injury by changing from your natural running style. You should also consider that whilst there are a number of athletes that endorse the benefits of changing their running style there have also been a number of reported cases of injuries resulting from the changes. At the end of the day it is a personal choice that only you can decide upon but you should consider that most research has failed to observe improved performance, or reduced risk of injury, following changes from a natural running style and therefore any change should be entered into with caution. Almonroeder T, Willson JD, Kernozek TW. The effect of foot strike pattern on achilles tendon load during running. Ann Biomed Eng. 2013 Aug;41(8):1758-66. doi: 10.1007/s10439-013-0819-1. Epub 2013 May 3. Daoud AI, Geissler GJ, Wang F, Saretsky J, Daoud YA, Lieberman DE. (2012) Foot strike and injury rates in endurance runners: a retrospective study. Med Sci Sports Exerc. 2012 Jul;44(7):1325-34. doi: 10.1249/MSS.0b013e3182465115. Giandolini M, Horvais N, Farges Y, Samozino P, Morin JB. (2013) Impact reduction through long-term intervention in recreational runners: midfoot strike pattern versus low-drop/low-heel height footwear. Eur J Appl Physiol. 2013 Aug;113(8):2077-90. doi: 10.1007/s00421-013-2634-7. Epub 2013 Apr 14. Gruber AH, Umberger BR, Braun B, Hamill J. Economy and rate of carbohydrate oxidation during running with rearfoot and forefoot strike patterns. J Appl Physiol. 2013 Jul;115(2):194-201. doi: 10.1152/japplphysiol.01437.2012. Epub 2013 May 16. Hasegawa H, Yamauchi T, Kraemer WJ. (2007) Foot strike patterns of runners at the 15-km point during an elite-level half marathon. J Strength Cond Res. 2007 Aug;21(3):888-93. Kulmala JP, Avela J, Pasanen K, Parkkari J. (2013) Effects of striking strategy on lower extremity loading during running. Br J Sports Med. 2013 Jul;47(10):e3. doi: 10.1136/bjsports-2013-092558.46. Perl DP, Daoud AI, Lieberman DE. Effects of footwear and strike type on running economy. Med Sci Sports Exerc. 2012 Jul;44(7):1335-43. doi: 10.1249/MSS.0b013e318247989e.